The more I thought about it, the more I realized that it is impossible to be totally unbiased on an issue. The most we can do is be conscious of our biases and factor that knowledge into our deliberations. We can also seek to replace hubris with humility. To be totally objective, it would put us in the category of a machine or computer. Unless you are Mr. Spock, you have emotions and cannot separate your logical reasoning from your emotions entirely. You also carry a set of beliefs that are made up of the sum of all the experiences you have had to date. You cannot detach yourself from your unique mindset any more than the earth can detach itself from the solar system. With herculean effort you may be able to change your orbit a perceptible amount, but you will always be subject to the laws of physics in your corner of the universe. Notwithstanding another “big bang,” you are going to orbit around the sun forever. One place to observe bias is when managers try to measure accurately the performance of people who work for them. Imagine a manager trying to write an objective performance appraisal. Because the manager is a human being, he or she will observe performance through the lens of how he or she feels about the employee. It would be impossible to factor out personal biases, but by recognizing that there is the certainty of being biased, the manager can take that into account. One tool is to use a correlation process where several managers review the appraisals each one has written. If you have an environment of trust, groups of managers can discuss the objective observations about an individual without getting defensive. In this open discussion one particular manager’s biases can become more visible. This practice reduces the problem of favoritism and enhances the level of trust in an organization. Another area where we struggle to be objective is when thinking about political issues. We are bombarded by information that is presented with strong biases already marinated in. Most of us prefer to listen to the “news” that is slanted in the direction we habitually lean. That gives us a kind of affirmation that our biases are valid. Just for fun I often listen to the news on a network known for having the opposite bias to my own. It is a kind of jarring exercise as I quickly see the how their biases are strikingly “wrong” only to realize that it could be mine that are so far off base. One thing is for sure, when interpreting political forces, there is no such thing as objectivity. Your opinion is a very personal thing, and the good news is that you can never get your opinion wrong. The bad news is that your opinion will never be totally objective, so factor that conundrum into your decisions and relationships with other people. This entry was posted on Saturday, December 13th, 2014 at 8:29 am and is filed under Candor creates trust, Communications, Enabling Actions, Organization, Trust. You can follow any responses to this entry through the RSS 2.0 feed. You can leave a response, or trackback from your own site. Hi Bob. Yes our mental models drive our thinking and our behaviors. Functional or dysfunctional they serve us whether we like it or not. I believe the key for us as leaders is to have those around us who can skillfully take us up and down our ladders of inference through careful inquiry. Even more powerful for leaders is to lay our mental models on the line and invite inquiry from others. It’s tough to do at times but very rewarding. You are right Mike. The key word you used was “skillfully” – that is the trick isn’t it? Thanks for igniting a great conversation topic Bob! Thanks Deb. 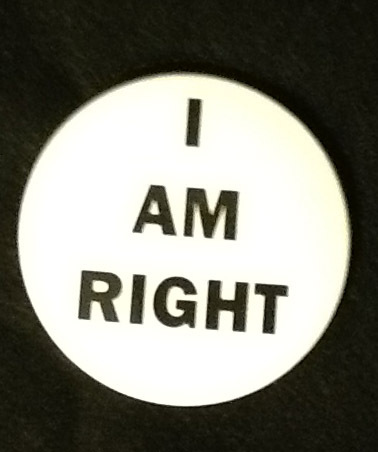 I actually hand out the “I AM RIGHT” buttons at my training sessions. People love them. As an Adult Educator, I have learned that differences of opinions and experiences can drive critical conversations that propel learning. I challenge those with different opinions ‘to prove me wrong’. These rise to the occasion because ‘being right’ is very important for everybody. Great information, and often valuable personal or professional growth, results. It’s a win-win because we all learn! Thanks Cynthia.It is interesting that the older I get the more I get it wrong. Fun to learn. That was a great reminder to all, but leaders especially, that perception of reality is not reality itself. A simple, yet not easy, shift of awareness that changes conversations, perception of others, and reaction to change. I like the idea of the “I am right” button also; maybe with “I don’t know what I don’t know” on the flip side. Well done, Bob! I too try to listen to diverse news from both sides. The proliferation of TV news channels (and other media) has allowed us to find news sources that are targeted at our niche and tell us what we want to hear and already agree with. It seems to be at least partially responsible for the deep political rifts where many won’t even consider the opinions/ideas of the other side.